Up to 50% of the population suffers or has suffered from sensitive skin. Some signs and symptoms of sensitive skin are redness, rough or scaly skin, and skin that itches and flakes due to exposure to certain factors such as sunlight, extreme heat or cold, or allergens. Sensitive skin sufferers also usually have a drier skin type, but find it extremely difficult to find products that can give the adequate moisturisation while not triggering a flare up of their delicate skin. How should we look after sensitive skin? Sensitive skin definitely needs special attention and here are the steps that we recommend to take care of and maintain your sensitive skin in its best form. Due to the irritability of sensitive skin, you should choose a suitable facial cleanser that reduces friction and abrasion as much as possible while still properly cleansing. The use of hypoallergenic products is recommended, as well as products that don’t contain preservatives or surfactants as they cause irritation. Micellar waters are the perfect cleansing agent for people with sensitive skin as it cleanses well and does not contain soap or harsh particles that will irritate the skin. Moisturising properly after a gentle cleansing reduces skin irritation and restores the outermost layer. This comforts sensitive skin, and relieves itching. One of the common components in anti-aging cream is salicylic acid that causes visible irritation to sensitive skin. However, one solution to avoid these adverse effects is to opt for emollients that contain sodium salicylate. The effect of emollients is the significant increase of collagen type 1, which is associated with anti-aging, and the significant reduction in the depth of wrinkles and the reddening of the skin. Some of the other common components are hydroxy acids, also considered as a strong irritant. It is recommended to substitute hydroxy acids for polyhydroxy and bionic acids, because as well as having the benefits of AHA without irritating the skin, providing additional antioxidants, they strengthen and give moisture to the skin’s barrier. 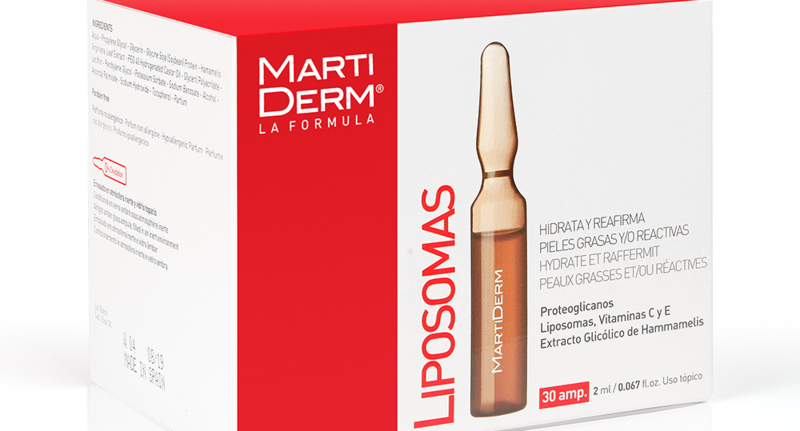 MartiDerm’s Liposomas Ampoule: The answer to sensitive skin hydration. Liposomas Ampoules are specifically recommended for mixed/oily and sensitive skin, with a fresh, light texture that feels pleasant for this skin type, with no oily sensation. One of its main active ingredients, Hamamelis virginiana, is beneficial to greasy skin. It has an astringent effect, which closes and tones the pores. Proteoglycans firm the skin and hold up to 1,000 times their weight in water. It is also packed with Vitamins C and E liposomes, which are extremely calming and gentle on the skin. These are antioxidants that neutralise free radicals generated during exposure to the sun, restoring smoothness, bounciness and hydration to dull and dry skin. Cleanse your skin with a gentle cleanser. We recommend the using a micellar solution. Tone your face with a gentle, hydrating toner. Apply half an ampoule of MartiDerm Liposomas ampoule all over the face and pat until absorbed. Apply your moisturiser as per normal. BEST SUNSCREEN EVER! Why regular sunscreens are not solving all your problems. MartiDerm is the leading Spanish pharmaceutical skincare brand specialising in the creation of effective dermatological formulations for targeting a variety of skin concerns.